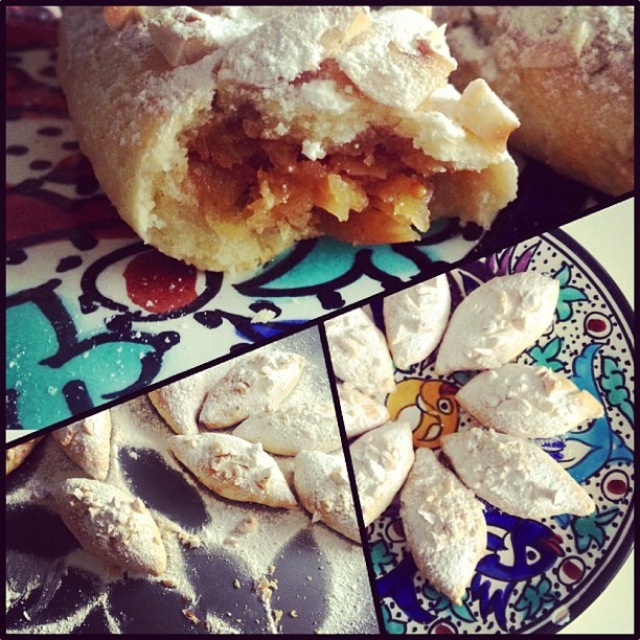 My sister in law, Filiz, shared this recipe with me during my last stay in Istanbul. I have adapted it slightly using inspiration from my once Lebanese neighbour and piano teacher, Solange. Filling; 2 grated apples, 4 finely chopped dried figs, 4 finely chopped dried apricots, a generous pinch of cinnamon, half a tbsp sugar, a knob of unsalted butter. Dough; 250g plain flour, 100g semolina, 125g plain butter, half a tsp salt, 1 level tbsp sugar, 1 tsp orange flower essence, half a beaten egg, enough milk to bind ingredients into a dough. For decoration; egg wash, smashed hazelnuts, icing sugar. First make the filling; heat butter in a frying pan and add the grated apple, chopped dried fruits, sugar and cinnamon. Filling is ready when it becomes beautifully caramel coloured. Allow to cool completely. While its cooling make the dough; mix flour, semolina, sugar and salt in a bowl. Add beaten egg, orange flower essence and enough milk to combine all ingredients. Work together with hands and when a supple dough is formed, turn out and cover with clingfilm allowing to rest for at least half an hour. Form walnut sized balls in the flats of your palms and squash into discs. Place a teaspoon of cooled apple mixture in the middle then work sides together so stuffing is concealed. I like to pinch outer edges together to form a teardrop shape. Lay on a lined baking tray and brush with egg wash and scatter with smashed hazelnuts. Bake cookies for 25 – 30 minutes on 180 degrees C. Cookies should acquire just the faintest golden hue. Sweet or savoury? You decide!